City Walls of the Ming and Qing Dynasties is part of the Tentative list of China in order to qualify for inclusion in the World Heritage List. Relatively few intact city walls are left in China, particularly when put in contrast to how many walled cities existed previously during China's dynastic periods. 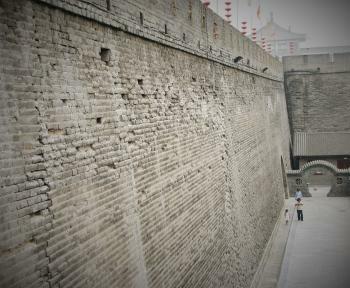 The Xi'an City wall is one of the best preserved (to my knowledge). The wall is immense, large enough to drive a car on. Spectacular site, but don't expect the best views until Xi'an, like much of China, improves the air quality. There are some indications that a expanded nomination will be brought forward soon. I would welcome both the nomination and the chance to visit other representative fortress architecture in China. As you walk, you can catch some views of the Silk Road sites that make the city famous.